I don’t seem to be able to blog as fast as things happen, so this post keeps growing and may be getting a little disjointed. Here we go. 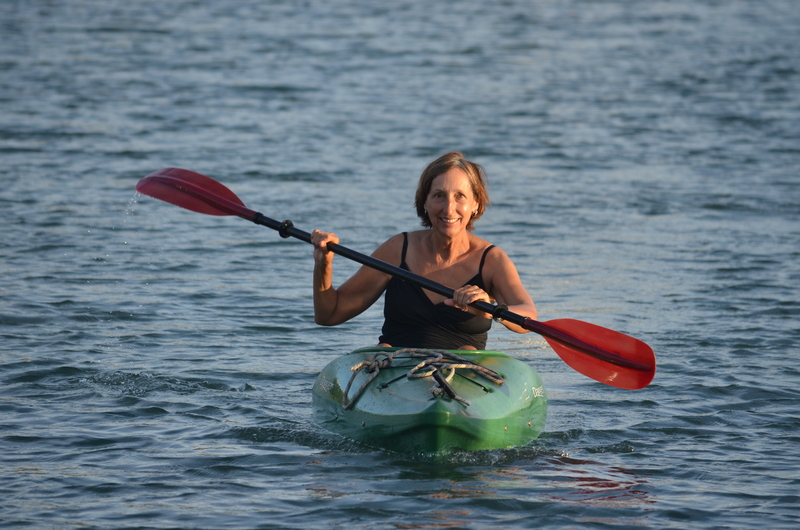 After a boat work semi-marathon we launched Compass Rose on January 22. Since then we have split our time between relaxing, hiking, hanging out with friends, and – of course – more boat work. The work encompasses all aspects of the boat. Some items are improvements like making an awning for the aft cabin hatch to keep out rain or moving the shower sump to a more accessible location and replacing the float switch; some are maintenance like touching up the rusty spots on the engine or oiling all the padlocks that we use to secure items on deck; and some are repairs or replacements of parts that have failed, such as the fresh water pump, the anchor snubber, and the watermaker. Sometimes I tell people I would be happy if I could just fix things faster than they break. One of the more involved problems was with our portable Honda generator, which we use when running power tools and the sewing machine. We were doing a few days of sewing projects and the Honda ran fine one day and wouldn’t start the next. I tried everything, but no luck. It seemed like the compression was low. I did a little research online and found that the motor has very tight tolerances in the valve guides and that if you run old fuel it can leave deposits that will cause the intake valve to stick open. I dug in and sure enough, the valve was stuck. Luckily I was able to grab it with vice grips and work it loose. We have done a few hikes into the middle ground – the peninsula between English Harbour and Falmouth Harbour, and along the coast up to the flagpole near Freeman’s Bay on the southeast side of English Harbour. We have coordinated some of the hikes with local boating events – finishes of more of the Talisker Whiskey Challenge transatlantic rowboats and the Antigua Superyacht races. We walked out to Fort Berkeley to watch one of the rowboats come in – and got rained on as we walked back. Not everything stops when rowers finish. Here we see Mannix cruising in his water taxi and a couple divers are helping the big yachts with their anchors. These guys had the good fortune to arrive mid-morning when they could see and lots of people were about to welcome them. A couple boats arrived in the wee hours of the morning. One team still remains to finish. The two women team – Inspirational Friends – had to have a new rudder dropped off to them and after 90 days still have 757 miles to go. “126′ Schooner, Gloria finished the regatta in style scoring their second bullet to elevate the team into third overall, but only just, Gloria was tied on points with 180′ Hoek designed ketch, Marie. Gloria took the podium place ahead of Marie by virtue of two first places in the regatta. Each anchorage on each island has its own character. English Harbour can be thought of as three areas: Freeman’s Bay, the outer anchorage off Galleon Beach; the middle area with Slipway Marina and Boatyard and Nelson’s Dockyard Marina on either side; and the lagoon anchorages consisting of Tank Bay and Ordnance Bay. We are at the edge of Ordnance Bay, which along with Tank Bay are homes to liveaboards who will probably never move their boats and abandoned boats. We ended up here because Freeman’s Bay was too crowded when we launched. Anchor too close to the mouth of either bay and the park people will tell you to move. They seem to like to do this late in the day, so you have little daylight left to find a new spot. Freeman’s Bay is the main cruiser anchorage, although there are a few more or less permanently anchored boats there. This is a nice anchorage except that when the wind goes light or swirls and/or the tide changes the boats can swing in different directions relative to each other. And just to make it more interesting, just today they moved one navigation marker a couple boat lengths into the anchorage, thus widening the channel and reducing the anchoring space. On the lighter side, we do see a lot of interesting craft in the anchorage. Commuting to work. This thing actually folds. We do a bit of hiking in the hills around Antigua’s south coast. It’s a combination of bird watching, exercise, and just doing something different. We often start our middle ground hikes by walking past this old rainwater catchment. We haven’t seen too many interesting birds this year, but the goats are out in abundance. On one of our first hikes this year we came across a baby goat that was young enough to be showing an umbilical cord. It had no fear of humans and walked right up to me. I mentioned that we have not seen many interesting birds this year, but the birds we do see have kept life interesting. We are still getting visited by Bananaquits flying into the boat and there always seems to be a frigate bird nearby. 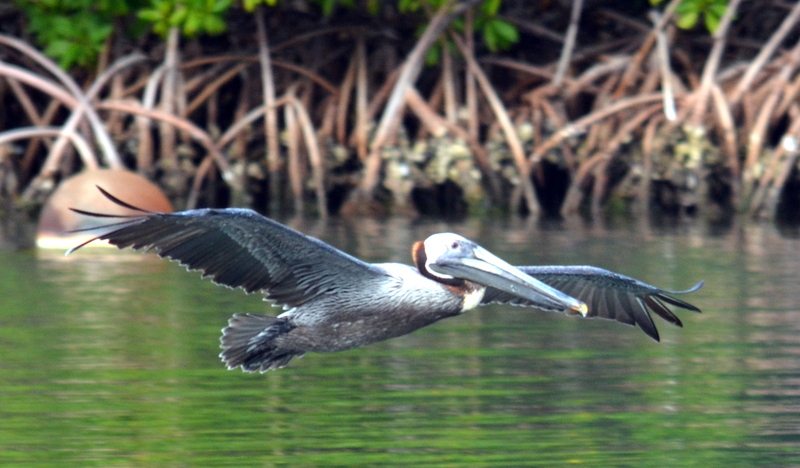 But the most entertaining are the pelicans feeding. The fly around the anchorage and go into a steep dive when the spot a fish. Just as they are about to hit the water they tuck in their wings. There is a huge splash and the bird bobs back up and either swallows a fish or takes off to look for another one. When Jimmy Buffet sings, “I don’t know where I’m a gonna go when the volcano blows” think “Montserrat”. This island is just to the southeast of Antigua. We have sailed past it twice – both times at night – and we could smell the sulphur each time. The volcano has had three major eruptions since the early 90’s. The last was just a couple months before we sailed by the first time on 2010. We have always wanted to visit the island, but the lava from one eruption filled in the old harbor. The new harbor has little anchoring space and a reputation for being rolly so we decided to fly over. Our friends Jack and Bobbi from Moonrise joined us for the trip. The plane was pretty small. Eight seats and two engines. An airport employee escorted the four of us and our three fellow passengers across the tarmac to the plane. When we got there one of the other passengers decided to lead us in prayer and it was pretty clear he wasn’t getting on the plane until we complied. We took off and turned south which took us right over English and Falmouth Harbours. The flight to Montserrat went quickly and we got some great views of the island. Our guide met us at the airport and took us to a trail in the rain forest where the Montserrat Oriole is known to hang out. They were there, but they stayed in the tops of the trees and were very hard to see. Despite the difficulty in bird watching, hiking in the rain forest was a refreshing change from the arid and mostly shadeless south coast of Antigua. From there we worked our way to the south end of the island to see the volcano. Our guide took us to the observation center where we saw a really good movie on the history of the volcano eruptions. The eruptions impacted the most densely inhabited parts of the island. Many people left the island because there was nowhere for them to live. 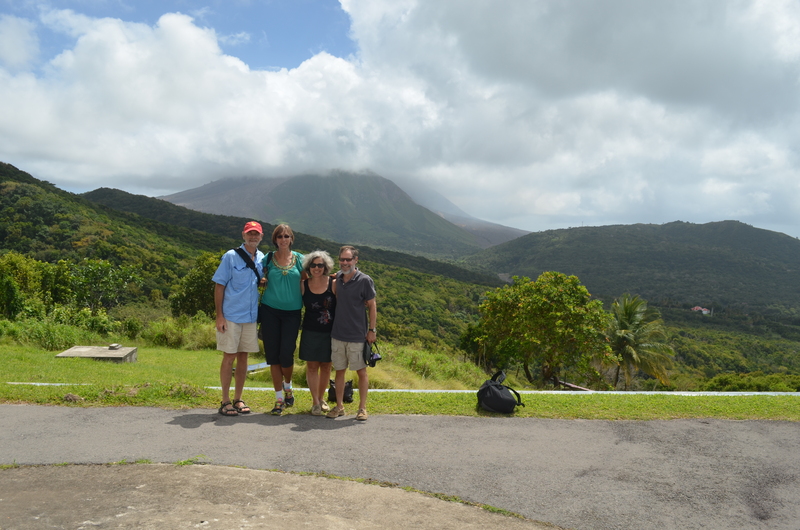 Our guide has lived on Montserrat all his life and he lost his home to the volcano as did most people. The island has various exclusion zones. The main one includes the old capitol city of Plymouth and can only be entered by scientists. The next one was closed until a couple years ago and is now only open during the day. People can live in the next zone, but must be ready to evacuate within 24 hours. Much of Plymouth was destroyed outright, but many buildings still stand and some are largely untouched except for ash. Unfortunately no one can live in the exclusion zones because of the uncertainty of whether or not the volcano will erupt again. The flight back was almost as interesting as the flight over. We passed over Jolly Harbour and got a good look at the Five Islands area. Will our heroes ever get out of Antigua? Stay tuned. This entry was posted on March 5, 2014 at 8:34 am and is filed under Uncategorized. You can follow any responses to this entry through the RSS 2.0 feed. You can leave a response, or trackback from your own site.